It’s been over 6 weeks since I last blogged, quiet for sure. Summer always seems to be that way for photography with me and no doubt many others, it’s hot and there are so many other things to occupy the time. The “light” is never as good in the summer – it’s too harsh with the sun directly overhead and heat haze can ruin a shot in a heartbeat, there is no Photoshop plug-in to cure that blight. Camera Club winds down and has walks in the countryside before the programme resumes in September with the Bridges competition. But it’s not all been quiet, the camera has received some love. I’ve cleaned it (although there is already crap reappearing on the sensor! ), and used it a few times. I’ve been bridge-chasing around London, a mental evening where I didn’t go into the City until 5pm and finished six hours later having visited Westminster Bridge, walked to Blackfriars Bridge, got the river boat to Albert Bridge before returning to Blackfriars and the Millennium Bridge at 10:30pm. Knackered was an understatement. I’ve played some more in the studio having expanded my light and diffuser collection, and that is showing some good progress too. Technically I’m getting there in the studio but need to be more confident and learn to deal with the subjects better. I ventured northbound last week on the M1, essentially to pick up something I’d “won” on eBay without realising quite how far north it was, and that it was collection only. 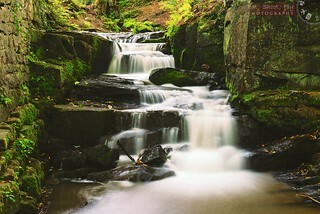 Taking advantage of this unexpected trip I stopped near Matlock at the Lumsdale Falls. I only had 30-45mins in reality, but it was well worth the look-around to see what the falls were like and the potential for long exposure photography. I quickly decided that there was a lot of potential but only had time to shoot from one relatively easy to reach location amongst the ruins of the mills alongside the brook. The bigger fall was just behind the location I shot here and needed some thought about the best position to get good images, so I will definitely revisit here sometime soon – probably in the Autumn as the leaves turn golden. The whole area was quiet and peaceful, and I could have spent hours there exploring. Another fall that was here that wasn’t photographed (fortunately) was the fall that I had. Setting up for the “Long View” shot a bit further downstream near the top of the big fall I slipped on the rocks and landed reasonably firmly in the edge of the brook. Cue wet shirt and buttocks for the rest of my journey, typically I made sure I didn’t drop the camera rather than protecting myself. Numpty. So with Autumn approaching hopefully we’ll see some better light with the sun lower in the sky, some nice leaf colours and many more opportunities. It won’t be long before I start to compile my LRPS submission, I want to make another two or three trips into London before deciding on my best images. I also want to do more work in the studio, and do some location model work as well as the winter approaches. Busy times ahead – the quiet times are coming to an end once more! Excellent commentary. I think we have all done that eBay thing! I can see from Flickr that your appitite for taking photo’s have not diminished and the photo of the Mini was just brilliant. « Spam! What is it good for?